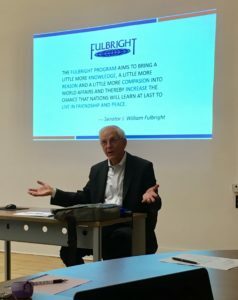 The world-renowned Fulbright program is an educational movement based on the principle of scholarly exchange between the United States and other countries. 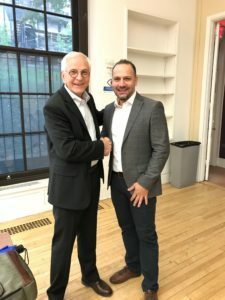 Last semester, Dr. Armando Bertone – Associate Professor and graduate program director of ECP’s School/Applied Child Psychology (SACP) program – was honoured to have hosted Dr. Fredrick A. Schrank as a J. William Fulbright Specialist in School/Applied Child Psychology. Dr. Fredrick A. (Fred) Schrank is the senior author of the Woodcock-Johnson IV, which is one of the most widely used and respected individually administered batteries of cognitive, oral language and achievement tests. He is also a licensed psychologist and a board-certified specialist in school psychology from the American Board of Professional Psychology (ABPP). He worked in elementary, middle, and secondary schools before earning a PhD from the University of Wisconsin-Madison. Dr. Schrank then taught at the university level prior to a twenty-five-year career devoted almost exclusively to the development and publication of the Woodcock-Johnson tests. In service to professional psychology, he has been an oral examiner for the American Board of School Psychology and president of the American Academy of School Psychology. In addition to delivering specialty lectures on curriculum development in psycho-educational assessment in ECP’s SACP program, Dr. Schrank led workshops on cognitive assessment for intervention of dyslexia and early cognitive and academic assessment/intervention. These workshops were well-attended by graduate students, faculty, and associated professionals from the university and community. Dr Schrank has contributed to changes to our professional training curricula in the SACP program by introducing alternate assessment techniques and tools he is an expert in. The ECP would like to extend their gratitude to Dr. Schrank for sharing his expertise, professionalism and generosity with both SACP students and faculty.